Our favorite Shinobujin has once again stumbled into more than he expected in Jon Merz's Slavers of the Savage Catacombs. 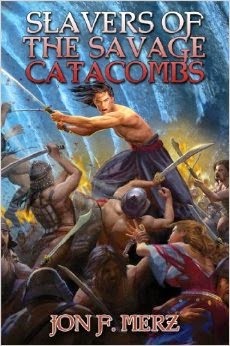 Note: Slavers of the Savage Catacombs is the second book of the Shadow Warrior series. The review of the first book, The Undead Hoardes of Kan-Gul can be found here. Otherwise, read on! After the truly disturbing events of his last mission, all Ran wants is to continue his journey to the West, to the city of Valrus, to find his beloved Cassandra. His next stop is the city of Chulal. There, he'll hopefully be able to find a caravan headed his direction that he can provide security for. But life often has a way of diverting even the most basic of plans, and a member of the Nine Daggers Shadow Warrior clan has obligations to more than himself and his heart. Almost immediately after arriving in Chulal, Ran finds himself face-to-face with another Shinobujin. Tanka has been stationed in Chulal for a decade, as an intelligencer. They exchange information, and stories from their training days, and Tanka is appropriately impressed with Ran's exploits against Kan-Gul and his undead army. Before Ran makes his next more, however, Tanka insists that they check in with Nine Daggers via the trained falks that he keeps as messengers. No matter what orders Nine Daggers sends for Ran, trouble does seem to seek him out, and along the way he comes across bandits attacking a village, a dead body left as a message for a caravan, and a crew of slavers. He finds evidence of his beloved Cassandra, and an army of warriors who just may be more horrifying than the undead hoardes he's just defeated. Jon Merz has a talent for packing each chapter with as much action as possible. Ran's flashbacks to his training days give the reader a look into why Ran makes the decisions he does, and how he is able to thrive in situations that nearly disable the other members of his party. Slavers of the Savage Catacombs is a fun adventure novel, in which the hero fights evil and keeps working towards getting the girl. It's the perfect book for a fun afternoon or two of escapism from the rather more mundane lives we all live. Highs: It's so much easier to hack and slash through armies when they're already dead, but Ran has a bit more to investigate here. Lows: The prose is sufficient, but not as lyrical as other authors. Verdict: If you're looking for something fun, with lots of fighting and epic heroes, you could do much worse than this.